I like writing random, rambling, long blog post titles that mess up your phone if you try to read the letter online or stretch the screen if you use a computer. It’s fun. Especially for Friday. It’s the little things, guys! Anyway, in keeping with the celebratory tone of our 2 year anniversary, we wanted to share a few short letters we received this week as well as some pics I’ve been hanging on to for a time such as this- submissions by YOU ALL of you & your LTT merch! I met my LTT Cosmic Twin! One fine day, I was cracking up reading the LTT comments when one commenter’s opinions kept catching my attention. We had sooo much in common… in only one day of comments: a love of Twilight, a hint of snark and humor, 3 year old daughters who didn’t sleep the night before, and the same name! 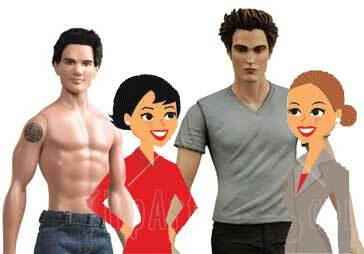 (Not to mention a love of Somerhalder, Skarsgard and that cute, little chain smoking monkey-Mr. Robert Pattinson!) I ended up replying to her that I though she was my LTT doppleganger… and that’s how West Coast Stacey (snowwhitedrifted) met East Coast Stacey. We ended up being pen pals, well email pals nowadays, ’cause who uses pens? Then twitter buds and we realized we were cosmic twins. 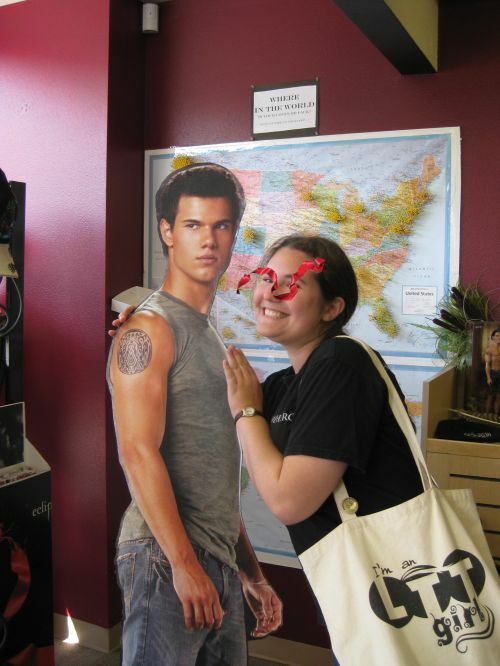 We became each other’s enablers, writing fan fics as well as a co-authoring a bunch of letters to twilight posts… and now we have a blog to discuss all the juicy goodness of this ridiculous little world we have found. This downward spiral has been one heck of a ride and I’m so glad of it! Thank you, LTT, for the magicness! This LTT girl takes a picture with someone familiar looking before heading to feed the alpacas with the snacks she keeps in her LTT girl bag. UC and Moon, you have helped keep the Twi-love alive. Here’s a pic of me when I went to Port Angeles and Forks this past summer with two Twi-friends, repping LTT with my favorite tote bag ever. We made total fools of ourselves, spending the extra five bucks to stay in the Twilight room at the hotel, and sporting fake wolf pack tattoos for our trip to La Push. Cause that’s Normal. 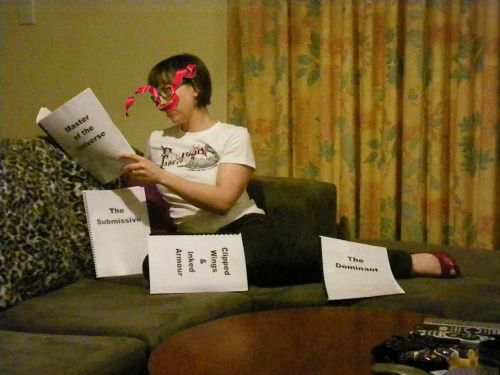 And Cledbo reads printed out fan fiction, rocking her “Fade to Sad” shirt while wearing hot red heels. That’s Normal. These pictures make me so happy! Nothing is more fulfilling than making a bad joke with your friend Moon over instant messenger one night, posting it on a blog the next morning, seeing people’s reaction to said bad joke & then seeing the joke ON a tshirt in a bar, in a foreign land, on a bad, feeding alpacas, embarrassing your families, etc. etc. etc! And in case you missed my comment on Wednesday, I had a horrific day at work and after my 10.5 hour work day, 2 hours driving & when I finally hit the pillow and looked at all the comments on my phone that night, I was so overwhelmed with all your love! I appreciate each & every one of you! I’m being Tweed Serious. (PS: If you have something from the LTT/LTR store, send us a picture- we’ll feature it eventually!!! And if you don’t own anything- DUDE! Put it on your Christmas list! And snowwhitedrifted made some new designs we’ll be unveiling any day now :):) Wearing shirts about vampires & werewolves is normal: Buy some now! Good times!!! Seriously love you girls for making me laugh all the dang time! @SWD & LTT – can I request a calendar. A good, old fashioned, LTT-featured wall calendar. I would start the 1st day of every month with a smile! ooh good idea. i’m sure cafe press has those. otherwise we fail at not making one….. will get in touch with SWD! On it, love this idea! 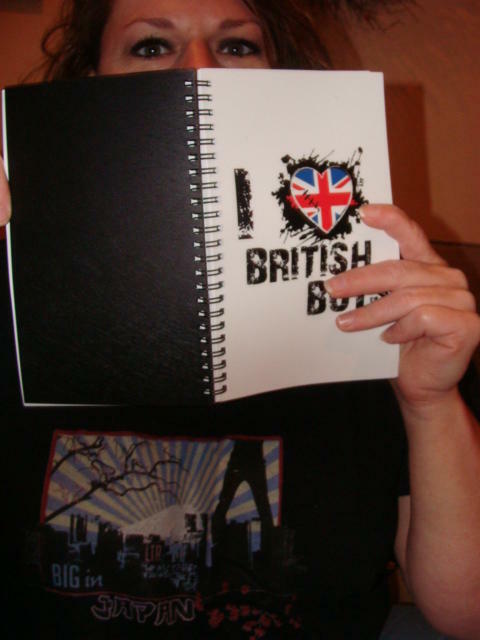 Woah – people seriously print and bind fanfic? No judgement here – just didn’t know that was actually done. Awesome. I mean, who hasn’t from time to time printed out 400 pages of fan-fic and spent the evening alone at home binding it with colourful yarn to colour-coordinate the collection in the book case? I know I…er.. haven’t. Ok I’m not actually awesome enough to have printed that fanfic out. But if I ever got around to it I would totally use office stationary AND the office binding machine to do it! Yep, ladies, I think you saved my day, and I know for a fact you have saved my life (from suicide due to boredom) MANY times! Love ya! Well said, I feel the same way!!! It’s fun to be a part of something on here. Hope your day goes better UC! Happy Friday, everyone! Sorry to hear you had a bad day the other day UC. 🙁 Hope the week is going better for you. Shhhh don’t tell work I snuck on here to comment. (stupid phone still hates Disqus) I missed it here too much being away for a couple days. we missed you! And I’m not telling!! My phone is letting me comment! Praise to Disqus IT!! UC!! Look! Look! I can FINALLY comment on Disqus from my phone! This is the BEST Christmas present EVER!! Thank you! It is! It really is! I’m pretty sure it’s because you mentioned Twilight blog to the IT guy when you called in. Guys love that! thanks for the laughs – keep’em coming! I love all these LTT meetup pics! I should of taken a pic of the time I went to brunch with Bookelockart the first day I met her and UC and then awkwardly made Brookie come to the airport with me because I was late picking up my husband from his flight! Fun, awkward times! Anywho… Seeing actual people I laugh with wearing these makes me so happy! #validating So cool to see!!! Thanks to Moon and UC for providing the awesomeness to design for. I can’t wait to see the new shirt designs! PS: seeing that pic of you, I can TOTALLY see you as a Snow White. No wonder they had you “play” her. Heeeyy!!!! 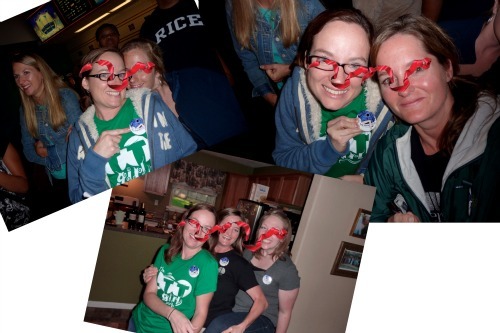 Thanks for sharing our pix, it was indeed fun times! I am not even embarrassed because Twiwind nights and Midnight viewings of teenage vampire love triangle movies are, say it with me, NORMAL!!! Oh, and side note…. With the change last week to disqus I changed my handle from ICanHandleIt to GoldBerryBecca. And yes, it’s a Tolkien reference. PS I love the ‘Most Popular Girl In School’ type community box thingy. It nearly makes up for no ups and downs thumbing. SJ, are you the other SJ from downunder or a different SJ? The same, couldn’t get back with just SJ. Yay! I’m not alone, even if no one has noticed my LTT bag in public yet. 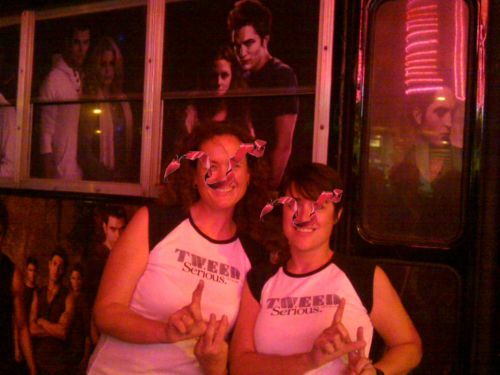 I was trying to explain to my non-Twi friend what was going on and why I was trying to show her a picture on a Twilight blog… I think I scared her, but UC says “wearing shirts about vampires and werewolves is normal” so it is all good. In going through recent photos, I realized just HOW OFTEN I wear my “That’s Normal” shirt. Cause no one knows what the heck it means and that’s normal. Cledbo, your picture is awesome!! I love it! 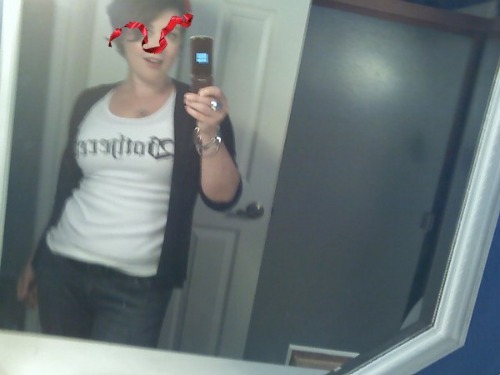 And it has given me an idea for a picture of myself in my shirt. Can’t wait to see the new designs!! Hmm, maybe I should send in a pic of me in my ‘Tweed Serious’ shirt leg hitching my NM carboard cut-out, wearing my favorite purple hoodie standing next to one of the greenish walls in my bedroom…because purple is cool and green is good.